Hello! Welcome to my humble web presence. I'm Mark Hamstra, 28 years young, wearer of many hats at modmore, resident of Leeuwarden, the Netherlands. Most of my time is spent building and maintaining awesome extras and tools at modmore, but I also love gaming, cooking, and my dogs. More about me. This site is where I share thoughts, cool projects and other oddities related to MODX, xPDO and ExtJS. 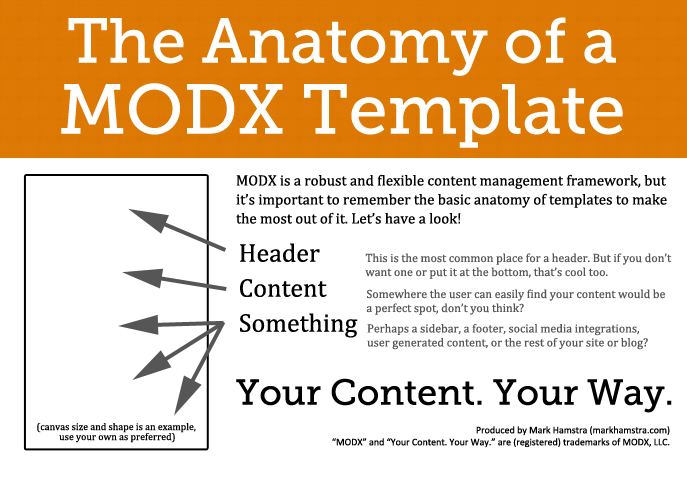 I also write about MODX regularly over at MODX.today. Sometimes I post three blogs in a week, sometimes there's nothing new here in a year. Read a random article. While there is most likely a much, much longer preparation to this great news, there was a very fascinating tweet this afternoon by Digital Butter, a MODX Premier Partner based in Hong Kong, which happens to be one of my clients last summer. You can probably imagine I got a little excited (and sidetracked from work, obviously) when I saw the tweet.. and to add to that, no more than two minutes after hitting the ReTweet button I got an email from James Bodell (lead Digital Butter fella and a great guy in general) titled "give this a spin", complete with a beta version of the package attached. Wicked!!! And so, I went off to investigate and see just how complicated it would be to get Dropbox integrated into my local test install. Turns out, it aint too bad but is frick'n awesome!! After installing the package, there's a few steps you need to take. Create a Dropbox Application and get the App Key and Secret codes from here. Create a new Media Source (see the screenshot that was tweeted above), choosing "Dropbox" as Source Type. Update the Media Source, and fill in your App Key in the consumerKey property, and the App Secret into the consumerSecret property. Also make sure the accessType is correct - this depends on what you chose while setting up your Dropbox application, and in my case this was the Application Folder. Save the properties. Refresh the page (this is needed for the Media Source to verify your App details), and expand the description for the authToken by clicking the green plus sign. You should now see a link there (if not, your App details probably weren't valid or you didn't refresh the page) which you need to click to authenticate the Media Source to access your dropbox. And that's it, and it doesn't take more than a minute or two (and adding some files to your new Dropbox/Apps/Name Of Application/ folder and letting that synchronize to the web) to end up with Dropbox integrated within MODX seamlessly. As with other Media Sources, you can restrict access to the Media Source through the Access Permissions tab so you have full control over who can access is and who can't. To use your Dropbox Media Source, it's probably easiest to drag and drop from your Files tab to the content or where-ever you want to use your Dropbox files. For example, if I wanted to write an article about some crazy bug I found, and I added the screenshot for it to my dropbox's app folder, I can write my content and drag the bug.PNG file to where I need it to appear. It will automatically get the right link which routes the request through your Media Source configuration and returns the proper file. James told me they are not ready to publicly release it yet as the amount of support requests and bug reports coming in would be too much for them to handle right now, and instead they are having the team and friends beta it for a bit. I'll definitely be playing with this some more, and hopefully this will see a release for others soon. You can however find a package and the source on Github. Now, I don't know about you, but I think we owe our Hong Kong MODX Development friends a round of applause for making this happen! Read 7 comments and share your own thoughts! I like numbers, and analyzing them to see what is going on. As a result of that, I spend too much time in my Google Analytics code figuring out what is going on with my site and what content is most appreciated. However, I keep on finding non-public URLs for blogs which haven't been published yet in my stats.. but no more. These visits are from when I visit a blog post which I've written to give it a quick proof-read, or to make sure the code blocks show up like they should. While not a disaster, I want to tackle this inconvenience and stop tracking my own visits. And hey, perhaps you can improve the quality of your clients' statistics with the same thing as well? There's a few things you can do. You can disable tracking for your IP through a Google Analytics filter, or by setting up a special page on your website/domain which sets a user cookie indicating we don't want Google Analytics to track us. While that would work, I also use my phone with HandyMan on 3G to work on my site or respond to comments and it would become a bit cumbersome to keep visiting a no-track page everytime I want to check my own site (as I'm pretty sure my phone's 3G IP changes quite often). Let's just get rid of the code! For this I first tried the "memberof" output filter on the 0 tag, however that gave problems when there was no user logged in as it returned a fatal error.. oops. I suspect this has been addressed in MODX 2.2, but as I haven't had the chance to test some quick-'n-dirty custom coding on my site in 2.2, I'm delaying doing the upgrade for now (tho it is a frick'n awesome release and I did launch some sites on it already!). Now what? Custom snippet to the rescue! All it does is check to make sure we've got an active user account, and if we do it checks if we are authorized for the "mgr" context. It either returns true (which translates to 1) or false (0), so on its own it's not too useful yet.. however that does work pretty well with the "empty" and "notempty" output filters/modifiers. To cut to the chase (this was supposed to be a quick tip) here's my Google Analytics chunk with the all new isAdmin snippet in action. We're calling the isAdmin snippet uncached, as per Caching Guideline 2 for MODX Revolution. We're checking if the result of the snippet is notempty (so we see if it has data, in the case of our snippet that's a boolean "true" or "1" when a Manager user is logged in). If the snippet returns something we put in an HTML comment, that way you still know the Google Analytics is being parsed. Next we check the output with the "default" output filter, which is the same as "empty". As we've chained these output modifiers, the snippet would have the HTML comment as value at this point in case the snippet originally returned "1". If it returned "0" it would still be considered empty at this point, which means we dump our Google Analytics code to the screen. Something else: as you can see I'm also using a setting with key "ga" to store my Google Analytics code in a system-wide or context-specific setting, allowing me to reuse the chunk across contexts without having to change it, by simply setting the right analytics profile ID in the context setting. I'm also telling Google Analytics to track the page load time, which is a nifty statistic to have. Alright, that's it for now! Enjoy! Read 3 comments and share your own thoughts! Revolution 2.2 available: What's New? Two weeks ago we saw the release of MODX Revolution 2.2 - you probably heard a thing or two about it already. In this article I will introduce to you the new features I think are most impressive. One of the hardest parts of writing this article is picking which features to discuss. Of course there's the big ones like the ability to use custom resource classes and media sources, but there's also a number of little (and slightly bigger) gems that may be easier to miss and may not have been covered in much detail by others yet. I think I'll cover those here. This was already added in 2.1.5, but in its simplicity yet powerful application it's worth a mention here plus it's such an easy thing to miss! Let's take an example of when this comes in handy. When working on a template you need to make some changes in the way your snippet works - but as you'll need to be able of reverting quickly (and you don't run VersionX) - it's not uncommon to copy/paste the old call and just put some random gibberish in front of the name (or was that just me?) like this, to prevent it from outputting. This trick works because it can't find the "zzzWayfinder" snippet, so it has nothing to output. All good right? Well, almost. MODX Tags are processed inside out which means that even if it can't find the "zzzWayfinder" snippet, it will still have processed our UltimateParent snippet call, even before it even checks if this "zzzWayfinder" thing exists. That's unneccesary processing time, slowing down your site for no reason! It wont be a devastating performance hit in this example, but every bit helps. The worst part is that, when the new snippet tag works, it's too easy to just leave the old snippet in there in case the client comes back with the request to revert it back next week... just in case that happens, the snippet is not bothering anyone there right? This is something we've been doing in Evolution for a while, and Revolution 2.2 now also gives you the opportunity to move your TVs to below the resource content. It's easier for clients (the tab is easy to miss and makes TVs sound like an afterthought, and what on earth is a "template variable", right?) and, well, with the all new shiny UI it doesn't look too shabby either!! Moving down the TV panel is easily achieved by setting the "tvs_below_content" system setting to "Yes", resulting in a more familiar look for those still used to Evo. If you fancy, you can also get rid of the title of the all new verticle tabs with the "show_tv_categories_header" system setting, though I personally like to keep it there. As you can probably imagine, there's some benefits there to implement that in your own Addon processors, and the three-page long Developing an Extra tutorial in the MODX docshas been updated to match. Custom Resource Classes of which Articles is the first and I think a pretty impressive example. I'm blacking out my MODX site this January 18th to protest against the SOPA and PIPA. While I'm not in the US, and my server isn't either, I may not have a direct threath in these two - but I'm with the techies here that think it will have major impact on everyone if this thing passes.. So I developed a little plugin to black out my site (yet give people who need access to my site the ability to do so). The plugin, SOPA Blackout, is available from the MODX Extras repo for MODX Revolution and is quite simple. On January 18th 2012, between 8am and 8pm (taken from your server time), the plugin will hijack all first requests made to your site (excluding manager access) and show a message explaining real briefly what's going to happen and give them a link for further information. In the background the plugin sets a session variable indicating the user has seen the notice. This session variable stores a timestamp which is checked and considered "valid" for three hours, meaning your visitor will only see the blackout once until their session is cleared (browser close) or its been three hours since they saw it. The user can either refresh the page (the plugin doesn't change the link) or click a link at the bottom of the page to go forward to what they were looking for. Easy enough, users will be alerted and can go on their way. It's a little way to show your support to the anti-SOPA and PIPA movements out there. The notice serves a 503 service unavailable error, so your search engine results wont be affected, though it's unlikely search engines will be able to index content during the time the plugin is active. The plugin also serves a retry-after header which is calculated based on the "until" time set in the plugin configuration (by default January 18th 8pm) - that should let the crawlers know when it's "safe" to return. My site will serve this message coming January 18th as I refuse to give up free internet without doing, well, something. I hope you will do too. Download the plugin. The source is also on Github. Oh, by the way, if you want to use different times - just go to the Plugin configuration and change the start/until dates there. Just make sure it's a valid date/time syntax and it should adapt easily. Is the blog too long? Here's the summary. All too often, people complain about the MODX documentation not being up to par, but far too little is being done about it. Even something as simple as reporting an error or missing information is vital – and something everyone can do. I'm going to challenge you to file 200 documentation bugs/request, and when we hit that milestone I will myself dedicate two full working days to fixing as many as I can. What's wrong with the docs, and why does it matter? Different people have different learning styles, and some need more handholding then others. There's also a ton of different aspects to MODX between the ins and outs of templating, the extensive API and on using the manager. Many of these are learned through trial and error, but not everyone has the time, resources or patience to learn then all. Documentation helps there. But in the past, developers have been far too busy to document it all – 2.2 marks a new era where most of new functionality was documented pre-launch – thanks guys! That does leave a lot of older docs waiting for the same treatment though, and that's where you come in. Found something wrong? Here's what you can do in 2 minutes. Go to bugs.modx.com/projects/docs/ and click the "New Issue" link in the left hand side or go straight to the new issue page. Note: you need to be logged in to the see the link in the left-hand side menu. If you don't see it, login with your MODX.com account (button in the top right). Fill in the form you see. Give it a descriptive title, and make it actionable. For example, "Login snippet does not mention placeholders for tpls" is much more useful then "Login docs flawed omg". The actionable part means it has to be specific enough that it can be executed in a reasonable time frame. While the system settings aren't all in the docs, making an issue titled "System Settings docs incomplete" (I think that's actually in the tracker right now) really doesn't make it high in (my) priority list. It lacks the part in me where I can see what the user was looking for, and I really can't just add all settings there.. that'd take me two entire days at least. Hit "submit" and go back to doing what you were doing. If you file a problem with the docs that is actionable, it may take you a few minutes to write it up - but the odds are pretty big someone else will spend more time to address the issue. The result of that may save others hours of time searching for the right information in the future. Your two minutes can have a huge impact. I would like to challenge the MODX Community. The challenge is really simple. We've got 14 open issues (40 total) in the docs bug tracker right now. Let's make that at last 200. And then what? What do I get out of it? When we hit the 200, that's a nice to-do list and I will personally dedicate two full working days to fix as many of them as possible. I may not be able to get them all done in that time, but I hope others will join this initiative and pledge to spend a portion of their time contributing to the docs. This effort will hopefully have a significant impact on the quality and completeness of the documentation, and will benefit a lot of people and of course the MODX Project. Nothing. While I've got a pretty broad knowledge of every area in MODX, a lot of people don't share in that knowledge and I don't see the flaws in the docs that newcomers do anymore, but I am able to explain it if asked. I believe that we as a community can make the docs better, and I'm backing it up with two entire days of work myself. In case you like to put a price tag on stuff, you could consider that a donation worth € 1 142,40 (or $USD 1,464.27) in labour (including taxes) to the community. What do you say? Are we going to make this work? Will you, from now on, file every issue (small or big) in the documentation, in order to reach that 200 issue threshold? Or are you going to pledge alongside myself to spend a certain amount of time on the docs when we do? Let me & the community in the comments, and share this challenge with people who work with MODX to get the ball rolling..
(You can click it to view the original sized one. Which is the same size if you're looking at this site from a proper computer, but may be easier to zoom in on from a mobile device of sorts).